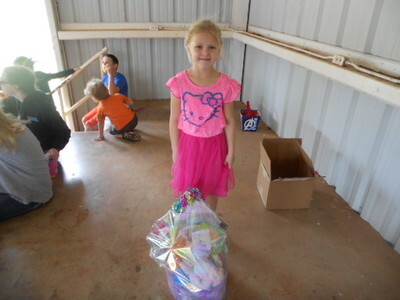 The Chamber will be sponsoring the Annual Easter Egg Hunt on Saturday April 20th. The hunt will be held in the Cheyenne City Park. Children ages 0 to 12 are invited to participate. The Egg Hunt will begin at 11 a.m. The Easter Bunny will be attending. He will have a basket full of goodies to share. Bring your camera! The Bunny loves to pose for pictures. There will also be face painting this year. There will be lots of prizes as well as four grand prizes. Prize baskets are made up of wonderful items from Chamber Member businesses. We hope to see you there! Contact Cindy at 580-497-3318 for more information. 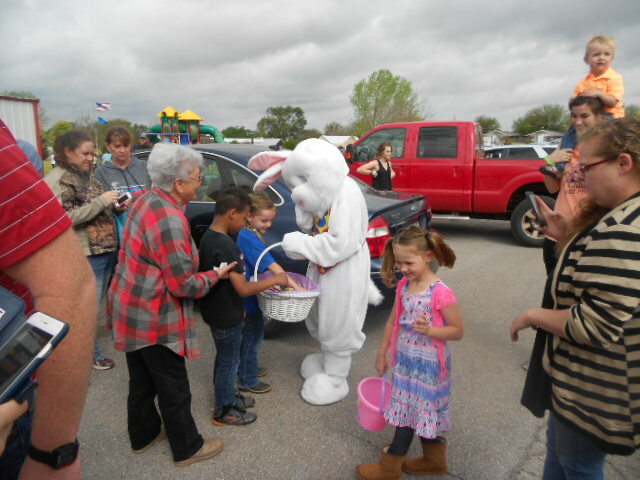 The Cheyenne Roger Mills Chamber of Commerce Annual Easter Egg Hunt was held Saturday, April 15th at the City Park. There were lots of boys and girls in attendance. The Easter Bunny visited with the kids and posed for photos. There were lots of prizes to be found. 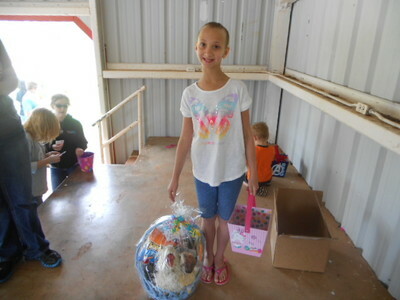 A grand prize was awarded in each age group. 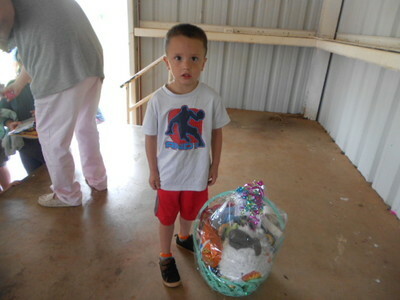 The grand prizes were baskets filled with goodies from Chamber businesses. This year's winners were Anthony Horeis, Kiyrah Vega, Brynn Beller and Leane Rogers. The Chamber would like to thank the donors who make this event possible. Security State Bank, Dobson Telephone, PSO, Northfork Electric, Roger Mills Memorial Hospital, Cheyenne Professional Drug, Dale and Judy Tracy, Nancy Hay, Cheyenne Lumber & Steel, The Bottom Line, Break O'Day Farm & Metcalfe Museum, York Insurance, Tweed's Hilltop Cafe, Four Point Energy, Sorosis Club, Karla Luthy, Town of Cheyenne, Martin's Trading Post, Jerry's Truck Stop, Johnny Mc's Food N Fuel and Market Square. 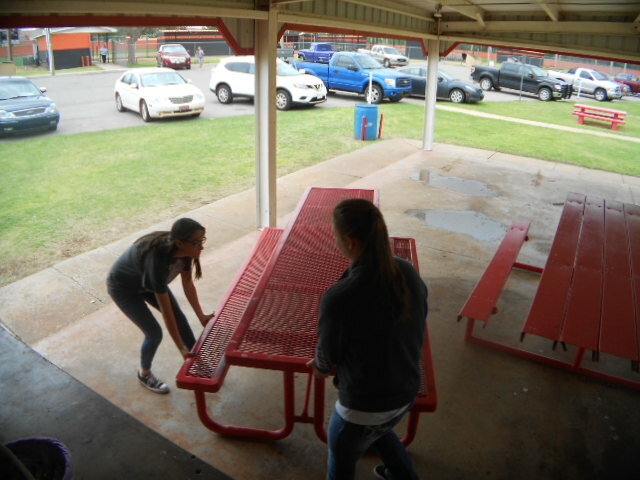 A big thanks to the Cheyenne School Group for all their help, Kelah Watson, Jaci Scott, Molly Malson, Kaylee McDaniel, Isaac Garcia, Callie Sappenfield, Olivia Lucas and Amy Waxler. Thank you to the Cheyenne Volunteer Fire Department and Fire Chief Levi Carter. Cindy and Elma Clift spent two weeks preparing and stuffing three thousand eggs. Big thanks to them. Thanks to Kenny Atteberry for his help with the heavy lifting. Thanks to our hard working Chamber members Debbie Tweed, Carrie Lovett, Penny Clift and Cindy Clift for working this event. Hope everyone had a great Easter. See you next year! 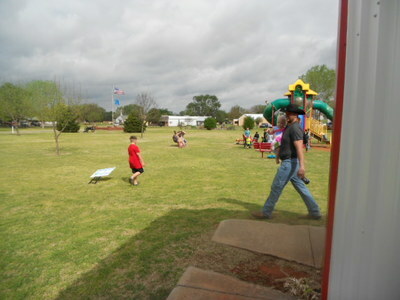 The Chamber Annual Easter Egg Hunt will be on Saturday April 15th. The hunt will take place in the Cheyenne City Park at 11:00 AM. 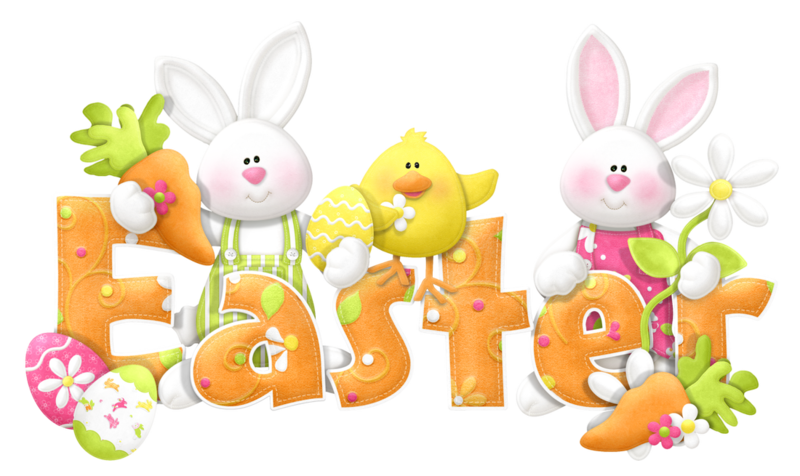 The Easter Bunny will pay a visit to hand out candy and take pictures with all the girls and boys. 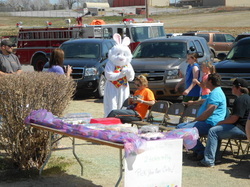 The Chamber's Annual Easter Egg Hunt was held on Saturday, March 26th in the Cheyenne City Park. 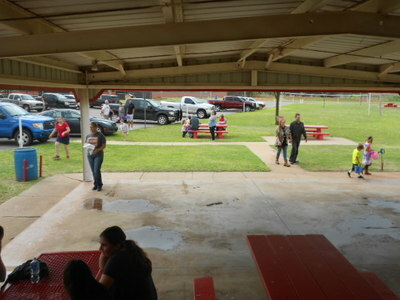 Lots of people turned out to enjoy the event. The Easter Bunny paid a visit to the hunt. 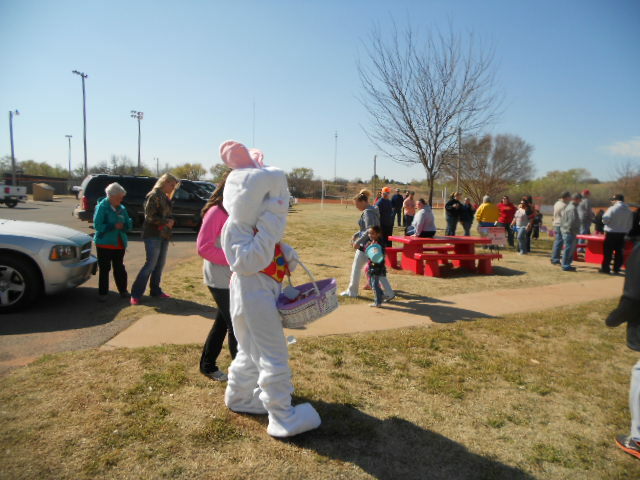 The bunny visited with children, handed out candy and posed for pictures. The Chamber would like to extend a big thanks to the bunny for being our guest every year! 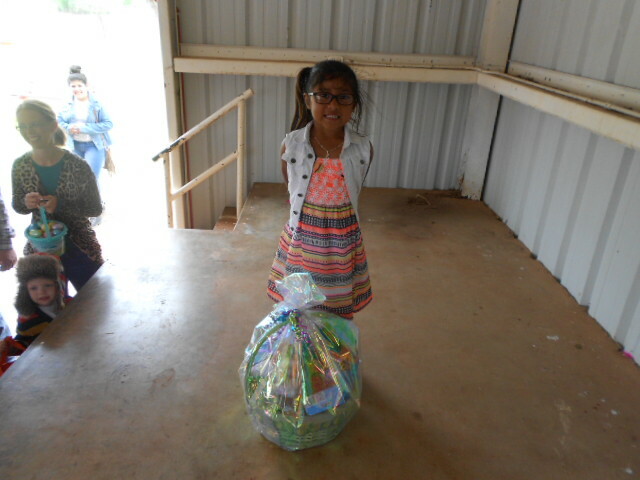 There were lots of prizes for all the kids. There was a grand prize winner in each age category. The winner of the 0 to 3 age group was Ryder Little, Pre-K to Kindergarten - Grayson Irwin, First and Second Grade - Gatlin Johnson Leonard and Third, Fourth and Up - Emilio Garcia. Each Grand prize winner received a basket of goodies made up of items from Chamber members. The goodies came from the following Chamber businesses: Cheyenne Drug, Washita National Battlefield Gift Shop, Tumbleweeds Restaurant, Tweed's Hilltop Cafe, Martin's Trading Post, Johnny Mc's, Market Square and C & P Treasures. Dobson Telephone, Roger Mills Hospital, Turley Ranch, Sorosis Club, Kiwanis, Cheyenne Lumber & Steel, Northfork Electric, Karla Gwartney, Joe & Nancy Hay, Jan Bailey, Sarah Batterton, Barbara Miller,Bottom Line, Break O'Day Farm & Metcalfe Museum, Jerry's Truck Stop, Market Square, Johnny Mc's Tweed's Hilltop Cafe, Tumbleweeds Restaurant, Town of Cheyenne and Martin's Trading Post. The Chamber extends a big thanks to our volunteers - Debbie Tweed, Carrie Lovett, Olivia Lucas, Destiny Green, Amy Waxler, Sara Haven, Rossie Cogden, Elma Clift, Allison Clift, Penny Clift, Cindy Clift and the Cheyenne Fire Chief Levi Carter. Thanks to everyone who turned out to make the Easter Egg Hunt a success! See you next year! 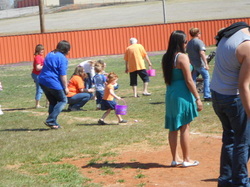 Please visit the Chamber Facebook Page https://www.facebook.com/cheyenneokcoc/ to view pictures of the Easter Egg Hunt. 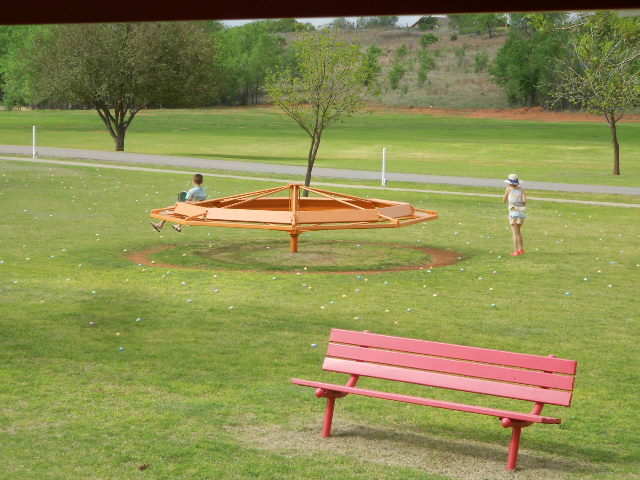 ​The Chamber Annual Easter Egg Hunt will be on Saturday March 26, 2016. The hunt will take place in the Cheyenne City Park at 11:00 AM. The Easter Bunny will pay a visit to hand out candy and take pictures with all the girls and boys. ﻿The Annual Easter Egg Hunt will be on April 19th. The chamber is asking for cash donations and prize donations. If you would like to donate please send your cash donations to Cheyenne Chamber of Commerce, P.O. Box 57, Cheyenne, OK 73628. If you would like to donate prizes please contact the Chamber Office at 580-497-3318 or email cheyennecoc@yahoo.com. The annual Cheyenne Roger Mills Chamber of Commerce Easter Egg Hunt was held on Saturday, March 30th in the Cheyenne City Park. There was tons of fun had by all who attended. One hundred fifty kids registered for the hunt. There were 3000 eggs hidden for the eager hunters. 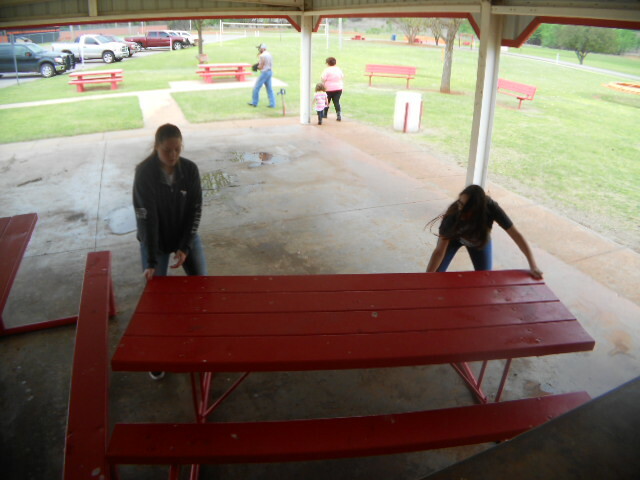 Along with the Easter egg hunt there were other fun activities. The cheerleaders were on hand to do face painting. Lots of happy kids were walking around with colorful Easter faces! The class of 2017 had a cake walk. Darren Atha from the Roger Mills Sheriff's Department was on hand to fingerprint the kids. The fingerprints are then on file in case of an emergency. Kids could have their picture taken with a Park Ranger. 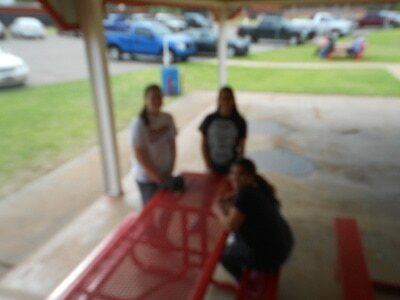 Park Rangers Kathryn Harrison and Teresa Ezersky were on hand to take pictures and play a game of musical chairs! 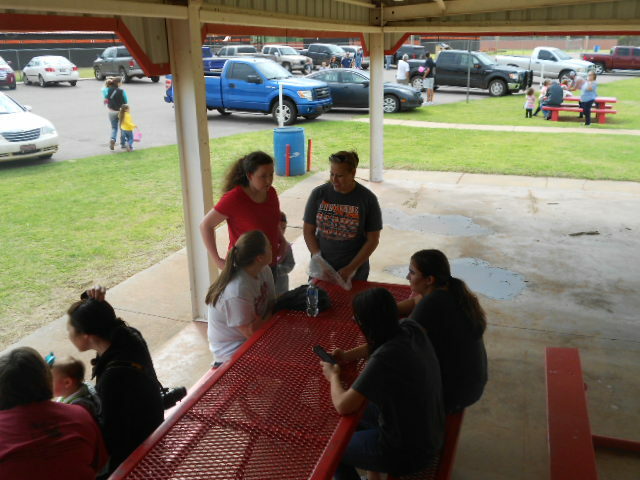 Concessions were provided by the American Youth Basketball Group. 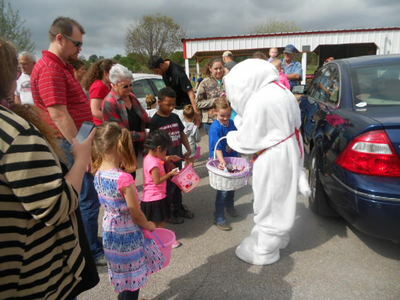 The Easter Bunny arrived to the delight of all the children young and old. He gracefully consented to hang around and take pictures with all the children. Then he had to hop on his way as Easter is his busy time of year! The eggs were filled with lots of prizes! 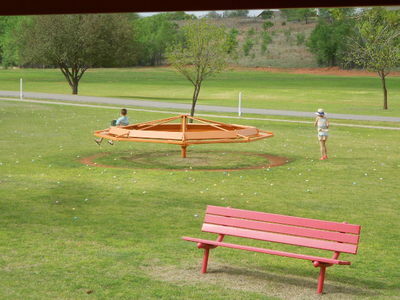 Kids could find gold coins, certificates for candy, pizza, pop or a special toy inside many of the eggs. The grand prizes were scooters and a tricycle donated by BS Trucking Company of Crawford. There was a drawing in each age group for the grand prizes. The Chamber of Commerce could not have this program without a lot of help from volunteers. We would like to thank the following people for their help. 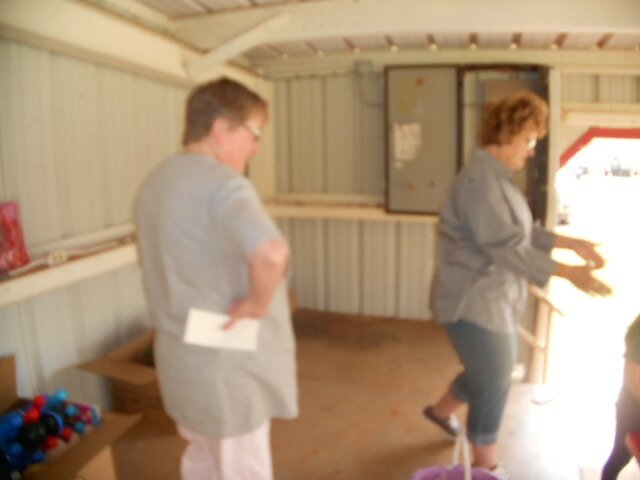 Chairman of the Event Regena Ford and Chamber Secretary Cindy Clift for organizing and preparing for the event. 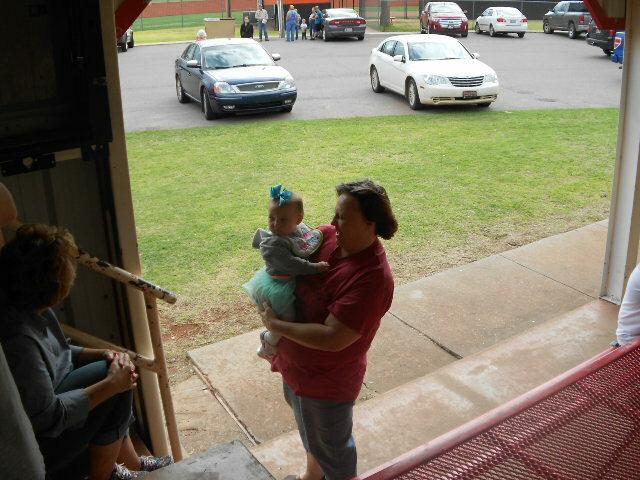 Elma Clift for helping to stuff 3000 eggs and helping hand out prizes. Melanie Cole for being on hand to take pictures & help with prize distribution. Kathryn Harrison and Teresa Ezersky from the National Park Service for playing musical chairs. The Cheerleaders and the Class of 2017 for providing activities. The American Youth Basketball Group for providing concessions. Darren Atha and the Sheriff's Department for the fingerprinting service. 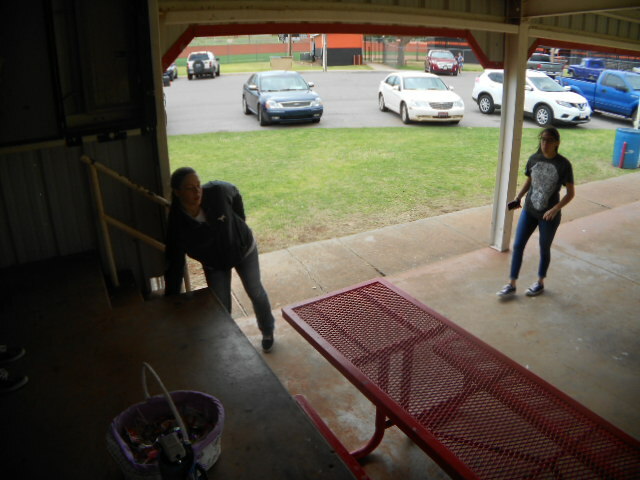 Colton Manske for stuffing eggs, helping with setup and prize distribution. 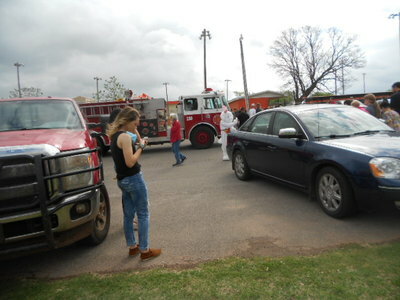 EMT"s Vera Holley, Vicky Manning and Derek Perkins for hiding eggs. Darla and Jason Beasterfeld for hiding eggs. 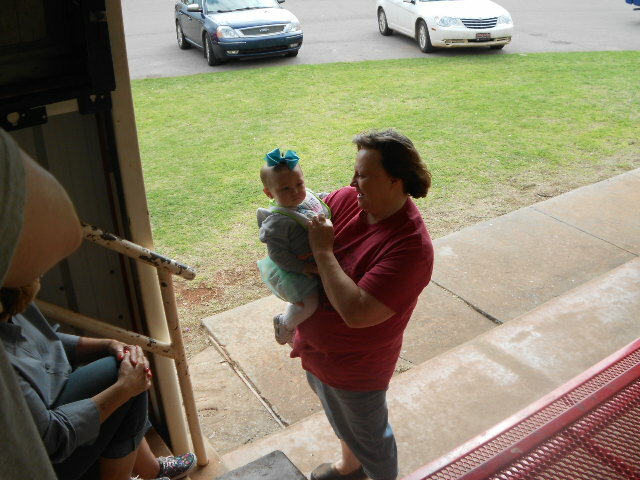 Penny Clift for helping with prize distribution. Marisha McDaniel for helping. 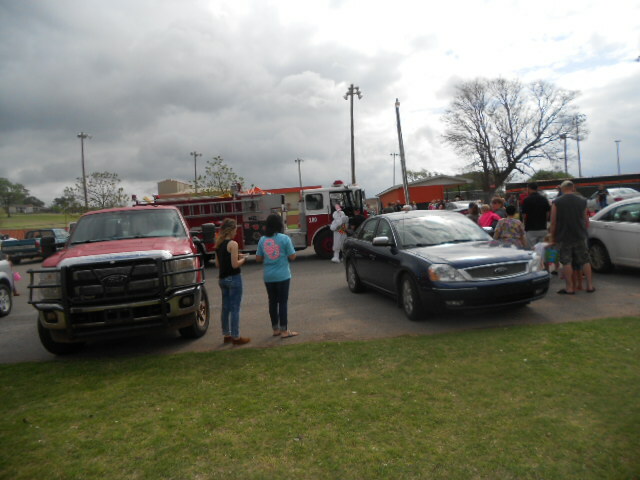 Jaryn Green for driving the fire truck. A big thanks to Ashley Lester! She had a very important job! This program would not be possible without the support of our local businesses and individuals through their generous donations. A big thanks to the following donors Security State Bank, Roger Mills Hospital & Buster Clinic, Sorosis Club, York Insurance, Cindy Malson, York Insurance, Judy Tracy, Frank Moler Trucking, Dirt Road Designs, Pioneer Cellular Network, MC Oil, Barbara Miller, Dobson Telephone Co., Masons, George & Flo Jean Whitehead, Fern Trammell, T & O Oilfields, SBJ Feeds, Bab & Husky Coker, Melody & Perry Pennington, Jana & Jim Maddux, Darla & Russell Calvert, Nancy & Joe Hay,Karla Gwartney, Dusty Kirk, Pat & Suzann VerSteeg, Kiwanis, Mike Smith, Barry Lucas, Packsaddle Bar & Grill, Becky’s Drive In, Cheyenne Lumber & Steel, Methodist Church, D & G Trash Hauling, Bear Tracks, Ellen Teague, Wen-Dees Grooming, Robert Payne & Family, Cheyenne Floral, Tosha Estrada, Cheyenne Abstract, Farmers Supply, Shrader Dental, The Variety Store, Cheyenne Tag Agency, Cheyenne Self Storage, Red Rock Liquor, Cheyenne Insurance, Bumble Bee’zz Day Care, Cheyenne Professional Drug, Market Square, Johnny Mc’s Food N Fuel, Zoe's, M's Motel, Roger Mills Farm Bureau, Las Casuelas, Martin’s Trading Post, Fabulous Fabrics & Jerry's Truck Stop. A special thanks to BS Trucking for donating the grand prizes! The kids loved the scooters! This was a great community program for families! We appreciate all the support and everyone coming out to enjoy the festivities! The next big event for the Chamber is garage sales coming in June. Be looking for more information in coming weeks! If you would like to help with community events the Chamber invites you to join us! We welcome new members, volunteers and new ideas. Memberships are on a business or individual basis. Contact us for more information at 580-497-3318 or email cheyennecoc@yahoo.com.